It's pretty much a fact that us Brits can't cope with the heat. At first everyone loves the sunshine but soon the muggy weather makes it impossible to sleep. For once I'm not one of those complaining. I've been making the most of it this year & have spent plenty of time basking in the sun. I still feel pretty exhausted & sweaty by the end of the day though so I'm always on the look out for products that can act as a quick pick me up. Last month I received an amazing care package courtesy of Arran Aromatics filled with various goodies & skincare products to help keep cool during the Summer. The gin was an instant hit for obvious reasons but since then I've been testing out these products from their Feel Good Formulas range. 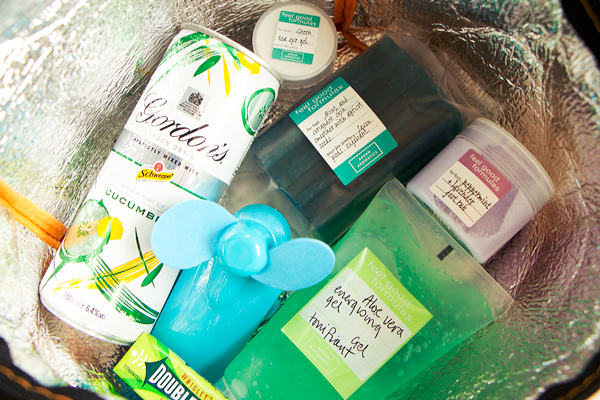 After long days on the beach & in the park this lovely collection of products have kept me feeling fresh as a daisy. If you need some help chillaxing during a heatwave then Arran Aromatics have got you covered. 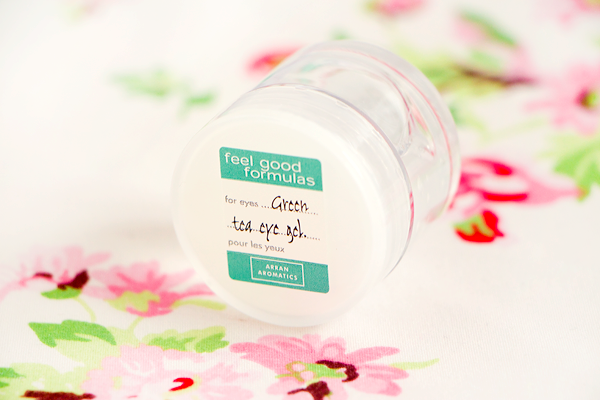 I first tried the Green Tea Eye Cooler Gel* quite a while ago & was immediately impressed with it's cooling properties. I was in need of a new tub so this couldn't have come at a better time. I prefer gels to eye creams especially during the Summer. They feel so refreshing if you keep them in the fridge overnight. Used first thing in the morning this gel perks up my peepers & firms up the eye area. I find it really helps to reduce puffiness & smooth out any fine lines. It features extracts of green tea & witch hazel which are not only great for your eyes but they smell really lovely too. It's a great choice if your eyes are easily irritated or if, like me, you suffer from hayfever. I kinda wish it was in a tube rather than tub though as I end up using way too much product. 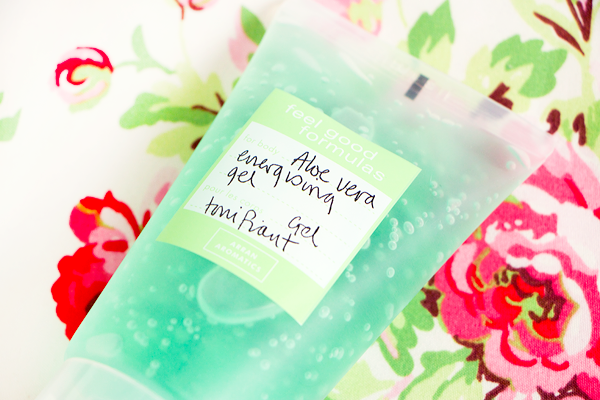 My favourite item I received has to be the Aloe Vera Energising Body Gel*. I mentioned in my July Favourites post that this product has barely left my side this Summer. I really love this as an after-sun product. This lightweight gel feels instantly cooling & soothing on the skin without any stickiness. The combination of aloe vera & witch hazel help to nourish and cool the skin. Much like the eye gel, this stuff smells incredible! It absorbs very quickly too so I've been reaching for this product instead of my regular moisturiser after a shower. 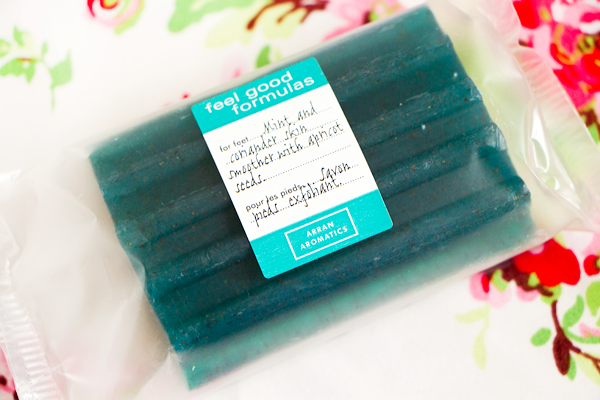 This energising gel really is the perfect pick me up for tired legs & bodies. Arran Aromatics' exfoliating products are some of my faves so I was excited to use their Mint & Coriander Foot Exfoliant Bar*. Wearing sandals always makes my heels look a little worse for wear which ironically is when you need your feet to look their best. Giving your feet a quick scrub with this bar will help to slough off dead skin & make them smell super fresh. It features essential oils of coriander & mint to stimulate circulation as well as easing any aches & pains. I have really sensitive soles, they're the only part of me that's remotely ticklish so I can only use the bar in short bursts. The ridges on the soap feel amazing, especially under the arches of your feet. If you've ever had a proper reflexology session then you'll know what I mean. Although this bar is intended for your feet, you can use it anywhere on your body. Those apricot seeds will give you one heck of a scrub! After giving my feet a good scrub with the exfoliant bar I've been smothering them in the Peppermint & Lavender Foot Rub*. The peppermint makes your feet feel tingly fresh & the lavender helps to soothe away tiredness. I always walk everywhere so my feet get pretty knackered after a day out. They feel much better after a quick massage with this foot rub. This product is really moisturising but to supercharge the effects you can pop some socks on after the cream & leave them on overnight. This locks in the moisture so you'll awaken with gorgeously soft, smooth feet. Peppermint & Lavender? Sound divine, even if it is for my feet! That energising get sounds fab - great to apply before bed I can imagine for an instant cool down!